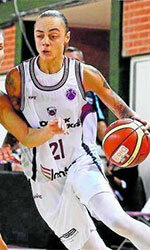 26-year old Puerto Rican international guard Jazmon Gwathmey (188-93, college: JMU) left Lointek Gernika Bizkaia (LFB). In 19 games she had 12.8ppg, 5.4rpg and 1.9apg this season. She also played 6 games in Eurocup where she recorded 12.5ppg, 4.7rpg and 2.0apg. The last season Gwathmey played at KEB Hanabank in South Korean league. Three years ago she was drafted by Minnesota Lynx (WNBA) in second round (14th overall). Gwathmey attended James Madison University until 2016 and it is her third season in pro basketball. The list of the past achievements is quite long as among others her college team won CAA Tournament for three years in a row (between 2014 and 2016). Gwathmey was also voted Latinbasket.com All-Central American and Caribbean Games Honorable Mention in 2018. She represented Puerto Rico at the World Championships in Tenerife (Spain) last year. Her stats at that event were 3 games: 12.3ppg, 4.3rpg, 1.0apg, 1.3bpg, FGP: 24.4%, 3PT-1 (71.4%), FT: 66.7%. Gwathmey has played previously professionally in Australia (Canberra Capitals) and WNBA (Indiana Fever and S.Antonio SS). CS Universitatea Cluj Napoca (Liga Nationala) added to their roster 31-year old American guard Tierra Henderson (178-87, college: UCLA, agency: Gamble Sports Management). She played last summer at Atenienses de Manati in Puerto Rican BSNF. In 13 games she recorded very impressive stats: 16.8ppg, 7.1rpg, 2.6apg and 1.7spg. Henderson helped them to make it to the final after they ended regular season as second best team. A very spectacular season in her career as she was voted to Latinbasket.com All-Puerto Rican BSNF Honorable Mention and League Player of the Week. She also played for Regatas (Liga de Lima) in Peruvian league. Henderson contributed to her team winning the Peruvian Liga de Lima Clausura title despite they ended the regular season at the second place. She represented USA at the African Championships in Bamako (Mali) eight years ago. Henderson is quite experienced player. Thanks to her pro career she managed to play on five different continents (Europe, Asia, Latin America, Australia and of course North America) in six different countries. Henderson has played previously professionally also in Australia (Power), Finland (Espoo Team), Lebanon (Energy), Portugal (Lombos Quinta) and Spain (UCAM Jairis). 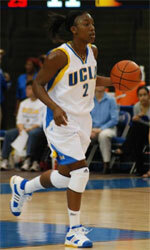 She attended Univ.of Calif.at Los Angeles until 2009 and it will be her tenth season as a professional player. The scouts decsribe her following way: Tierra Henderson, is a combo guard who can play both positions and is able to hit the mid range shot and 3 ball. Henderson, is a tenacious defender, causes havoc for opposing players. At 5'10, Henderson is a big guard that rebounds well. She brings energy and excitement to every game she enters. #1. This week's number one is an international guard Tayra Melendez (180-93, college: Rhode Island, currently plays in Croatia). She could not help Sibenik (5-9) in their last game. Despite Melendez's very good performance Sibenik lost 63-67 on the road to the higher-ranked (#5) Tresnjevka. She was the top scorer with 19 points. Melendez also added 7 rebounds, 4 assists and 5 steals in 40 minutes on the court; quite an impressive performance considering it's only her third season in pro basketball. Melendez has individually a very good year with high stats. She averages: 18.0ppg, 9.5rpg, 3.3apg, 2.0bpg, 3.0spg, 2FGP: 58.8%(20-34) and FT: 56.0% in four games she played so far. Melendez is currently a member of the Puerto Rican senior national team. #2. Second place goes to an international guard Jazmon Gwathmey (188-93, college: JMU, currently plays in Spain). She was not able to help Gernika (15-5) in their last game on Sunday. Despite Gwathmey's good performance Gernika was crushed 71-48 in Vitoria-Gasteiz by the lower-ranked Araski (#7). She was the second best scorer with 12 points. Gwathmey has relatively good stats this season: 12.8ppg, 5.4rpg, 1.9apg, 2FGP: 44.5%, 3FGP: 28.6% and FT: 61.7%. She has a dual citizenship: Puerto Rican and American. Gwathmey is in the roster of the Puerto Rican senior national team. Strangely she has never played in Puerto Rico. #3. The Puerto Rican player who performed third best last week abroad was an international point guard Jennifer O'Neill (165-90, agency: LBM Management, college: Kentucky, currently plays in Russia). O'Neill was not able to secure a victory for Spartak Vidnoye (6-8) in their game against Enisey Krasnoyarsk (8-7) in the Russian PBL. She scored 6 points in 16 minutes. Spartak Vidnoye was badly defeated 93-75 in Krasnoyarsk by the higher-ranked (#4) Enisey. It was Spartak Vidnoye's third consecutive loss in a row. There are only four games left until the end of the Regular Season. So now every game will be critical. This year O'Neill's overall stats are: 9.9ppg, 3.9rpg, 2.6apg, 1.2spg, 2FGP: 42.4%, 3FGP: 47.4%(9-19) and FT: 72.7% in 13 games. She is another player who holds two passports: Puerto Rican and American. O'Neill is also a member of the Puerto Rican senior national team. Apparently she has never played in Puerto Rico. #4. Guard Gileysa Penzo (175-97, currently plays college basketball in the States) couldn't help the Oklahoma (2-4) in their game against the Kansas State University (4-2) in the NCAA. Penzo's contribution was not very remarkable in Sunday's game. She scored only 2 points and added 5 passes. The Oklahoma was defeated 83-75 in Manhattan by the Kansas State University. It's Penzo's fifth season with the team. Penzo's total stats this year are: 0.5ppg, 1.7rpg and 1.2apg. She used to play for the Puerto Rican national team back in 2012.